Jonathan Joseph is a young centre with immense promise and someone who could be a constant feature in the England side in the coming years. The London Irish back came through their youth system and formed a key part of the England U20 side that came second in the 2011 Junior World Championships. At club level, his breakthrough season was in 2010-11 where he played in 13 Premiership games and scored five tries. 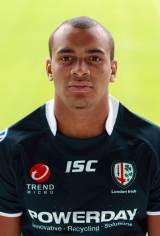 His current season has been disrupted with injury but when he turned out for the Exiles, he made a huge impact. His remarkable rise was marked with a nomination for the Land Rover Discovery of the Season award. He failed to collect the award but he was named on England's tour to South Africa as one of 42 players to make the cut. His huge ability was clear to see when he took to the field against the Barbarians from the bench and scored two quickfire tries. That performance propelled him into the Test side and he was named among the replacements for the first Test against the Springboks and got a couple of minutes towards the end of the game. But that did enough to impress Stuart Lancaster and come the second Test - with Brad Barritt sidelined through injury - Joseph was named in the starting XV. Joseph retained his place for the final Test when England pulled off a creditable draw and he was named in England's 32-man squad for the autumn internationals following a steady start to the new Premiership season with London Irish.